Over/Under: Under 172.0 at 1.90 Bet Now! The hosts come into this game with a 0-6 record and they are the team that will drop out of Group A when the Eurocup continues with the Top 16. 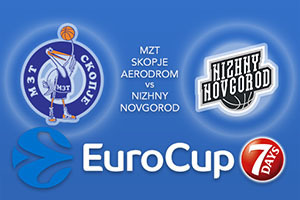 This is a chance for the hosts to give their fans something to cheer about but Nizhny come with a 3-3 record and something to play for, so it could be another difficult evening for the Skopje faithful. While the hosts have lost every game of the season so far, they will look back on the previous clash with Nizhny and wonder what might have been. In the end, Nizhny won the game by 88-74 but this was the score line after OT. The regulation time finished 70-70 and perhaps if Skopje had managed to nick that game, things would have turned out very differently this season. It isn’t possible to turn back time but it is possible to go out with a bang and that could be the best way for MZT to put a smile on their fan’s faces. Xavier Thames has provided an average of 16.8 points per game this season, and he is currently ranked seventh in the Eurocup scorers, which isn’t bad for a player in a team who are yet to win a game. The away team comes in the knowledge that a win would secure third place and it would give them a fantastic chance of clinching second spot when they take on Cedvita Zagreb in what could be a winner takes all game. Nizhny got past Skopje in the most recent outing but as mentioned above, it took OT to cause the gaping chasm at the end of the game. Ivan Strebkov got the MVP for his performance in the last round and he currently sits with an 18.2 point average in the campaign. This sees Strebkov sit fourth in the record of scorers this season. The bookies may think that the hosts will be fired up to grab a win but you can take Nizhny Novgorod at -3, at odds of 1.90. If you are looking for the Over/Under market, go UNDER 172.0 at odds of 1.90. Bet Now!